HiTech Sports is proud to supply the world renowned Nautronic scoreboard range across Australia. Nautronic are an FIBA certified scoreboard manufacturer and are renowned around the world for their cutting edge technologies and high quality products. Revolutionary Naucon 1000 colour touch screen controller (on certain models), well renowned for their user friendly operation. Within the Nautronic Scoreboard System is a wide range of high quality time measurement and score keeping equipment to suit any size sports centre from a State Primary School to a FIBA Certified Sports Stadium. Nautronic multisport scoreboards are pre-programmed for over 21 different sports and growing. It is operated via the Touch Screen Naucon 1000 controller and is easily updated with new official rules from the respective international sports federations. Can be easily be mounted via four L shape brackets along any side or top and bottom via a neat track built into the scoreboard side. For more information on our scoreboard systems watch the following videos. Nautronic scoreboards are built in a strong yet light aluminium frame and body with black acrylic front covers for timeless design and modern finish. The front covers have been tested according to DIN 18032-3 standards (safety against ball throwing) and the LEDs used in the board are high power, 10 year warranty LEDs. Nautronic scoreboards are equally manufactured for outdoor venues and suited for warm/cold and dry/humid climates. The high power LEDs ensure perfect visibility – also in direct sunlight and even from an angle of up to 170°. The outdoor scoreboards are designed for outdoor use and are weather proof. Nautronic scoreboards are sure to be seen with their unique digit-sizes and magnificently clear LEDs – visibility from all distances is available when choosing a Nautronic scoreboard. Displays are built with character heights of 12, 15, 21 or 30cm to obtain the best possible visibility for the spectators. Brightness has an impact on viewing distance, so each character displayed has many diodes to ensure the clear digits can easily be seen from a distance. Electronic custom team names are a great option that is already included on some scoreboards as identified by the suffix “T” or can be added to most scoreboards during manufacturing. With this feature you can easily personalise the team names for each game such as HiTech Hotshots U19 v HiTech Hell Raisers U19. Can also be used for “Moving Text” displays such as “Please be seated as the game starts at 7pm”. The message board can also display player names and numbers eg, Before the game display a moving message such as “Please be seated as the game will start at 7pm” , then change to “Player 1 – Joe Smith, Player 2, Steve Irwin etc” then as the game starts change to “HiTech Hotshots U19 and HiTech Hell Raisers”. All of these messages can be entered directly into the Naucon 1000 or via a USB, download the blank csv file, enter the names and messages via your computer then upload into the Naucon 1000 via a USB. The Naucon is a very high tech controller with lots of other easy customisations such as edited times and periods etc. A Nautronic text display can hold texts up to 1000 characters and all special characters are supported by the software. Nautronic Scoreboards and Shotclocks are wireless as standard, each item just requires a power point. They are easily upgradable with any game or rule changes via the USB. If you enter the player names and numbers into the console, during the game you can add any points or fouls etc to a particular player then download via the USB to keep a record and game statistics. Nautronic Scoreboards have a complete range of INDOOR and OUTDOOR scoreboards in many sizes and configurations with minimal or comprehensive information to be displayed. Indoor Scoreboards – These are generally smaller in board and digit size, includes sirens and a range of information so plenty to choose from. From a basic small scoreboard 900mm square with a simple Naucon 10 controller to a standard board using the smart Naucon 1000 and then right up to an FIBA Level One board displaying player names, numbers, points, fouls etc. Then the next step are the huge video display boards often seen above the main court in big arena’s. All wireless, just need power to the scoreboard. For more information watch our Indoor Scoreboards Video (right). Outdoor Scoreboards – These are generally larger with large digits so can easily be seen across large sports fields in bright sunshine through to bad weather. Again, many variations, sizes and configurations are available. All wireless, just need power to the scoreboard. For more information watch our Outdoor Scoreboards Video (right). We are ready to guide you in finding the exact scoreboard you are looking for to cover your needs. 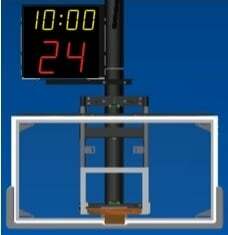 Nautronic has a range of wireless shotclocks to suit the scoreboards. Just need a GPO to power up. Ranging from 210mm high digits with end of period lights to larger systems with game time and then the FIBA Certified cubed shotclocks. Shotclocks are often mounted on the rear wall, behind the glass backboard or above the backboard on the mast via our custom mounting brackets. 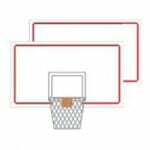 The NG 280 LED backboard lights for the end of period and shot time will give that FIBA feel for any sports court but is required for FIBA competitions. 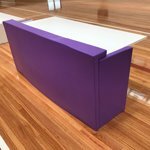 Scorebenches – Simple folding table with wrap around front pad offering maximum protection to players. NG280 LED backboard perimeter light array. Red LEDs End of Period and Yellow LEDs for end of Shot Time as per new rules. Required for all FIBA level 1 & 2 competition. SBST18 Stadia scoretable on wheels, foldaway with padding. 1800mm – Various Colours Available.